I drove to Target yesterday to try and find a crown to wear for next week's show when I came upon this taco stand. If you live in Los Angeles, you can find it on Virgil Avenue, just above Beverly Boulevard. 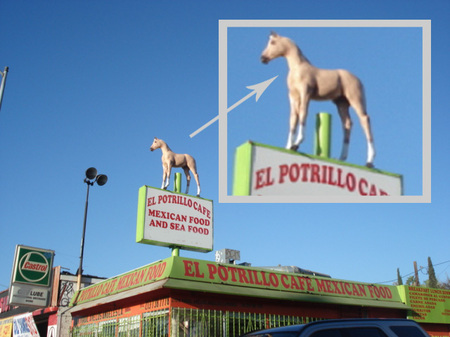 What distinguishes it from the thousands of other taco stands in LA is the giant plastic horse on the sign. 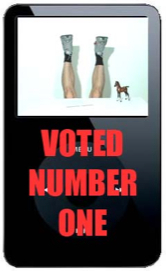 Is it just me, or does that horse look eerily similar to a FORMER GUEST on the show? PS: Dear Mexican viewers: What's a Potrillo? PPSS: No luck with the crown. According to http://translation2.paralink.com/, "potrillo" is Spanish for "foal". Which makes sense. I would generally interpret it as "little pony", but "little colt" would work, as well. Portrillo: Caballo joven de menos de doce meses de edad. Yes, it's an A..hole memorial. Murder is bad. El caballo (en femenino, yegua y de nombre científico Equus caballus) es un mamífero perisodáctilo de la familia de los équidos, herbívoro, cuadrúpedo y de cuello largo y arqueado. I wonder if you asked a salesperson...and what their expression was. Here is your third confirmation: a potrillo is a small horse that is no more than 3 years old. You can now start your own wiki. As to the crown, you can probably grab a handful at Burger King! You could always drop by Burger King an order a Kid's Meal or whatever they're called, and use the crown that comes with it. ...Is there still a crown coming with those, anyway? I should send you a crown in the snail mails. A potrillo is pretty much a young horse... like a baby horse. Wait a minute...doesn't it have to be a crown made of thorns? Does the horse structure atop the building in any way indicate the type of meat used within? A Spanish-speaking person isn't necessarily Mexican. Count that if you think it's entertaining. keep searching for that crown! 1. m. Caballo que no tiene más de tres años. 1. male name. Horse that is no more than three years old. 1. m. Caballo desde que nace hasta que muda los dientes de leche, que, generalmente, es a los cuatro años y medio de edad. 1. male name. Horse since the time of birth until it changes the milk teeth, which happens, generally, at the age of four and a half years old. I believe there are little fairy/princess crowns in the Halloween section at Target. If they've lasted this long. That being said, Party City is probably the better place to go. If you have that there, I don't even know. Ummm - is the horse supposed to indicate the taco filling? wtf, steve. you're an idiot. Obviously they won't have HORSE as taco filling. You go die now.